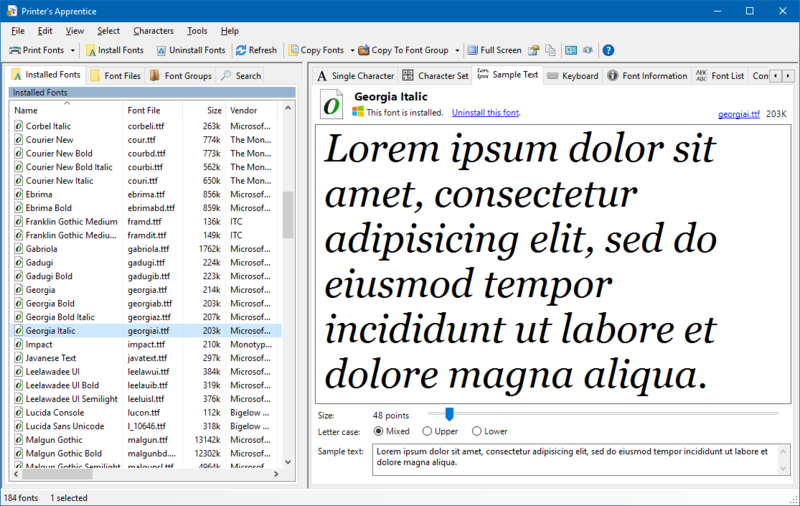 Printer's Apprentice is a professional, modern font manager and printer for Microsoft Windows. Preview, manage and organize your fonts. Print gorgeous font catalogs, books and sample sheets. Search your font collection by a variety of attributes. 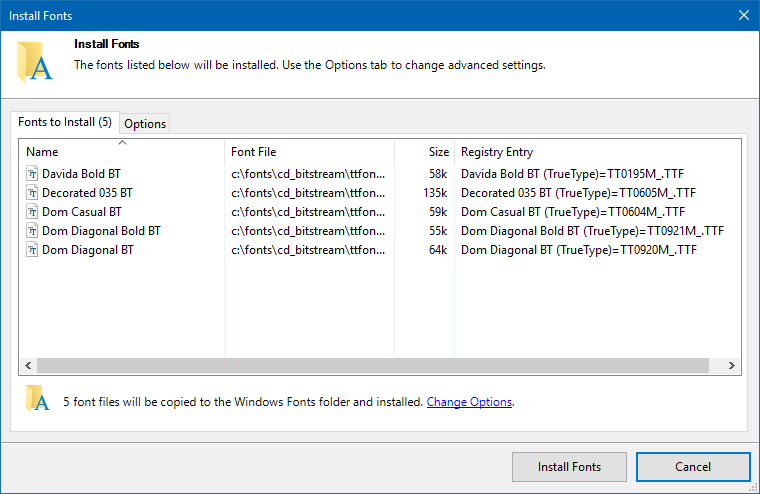 Install and uninstall fonts as needed. OpenType, TrueType and Type 1 formats - all supported. Awesome technical support direct from the developer. 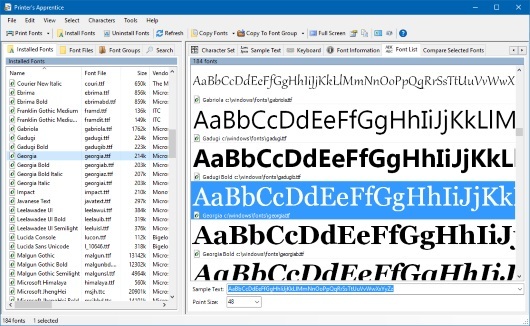 A superior font manager for Windows 10, 8 & 7. Our customers think Printer's Apprentice is the best font manager available! Printer's Apprentice makes it easy to find the perfect font for your project. 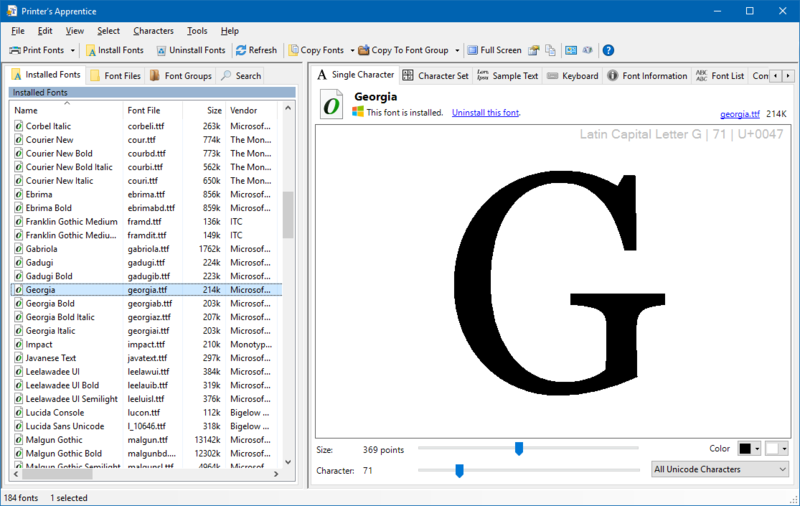 Use Printer's Apprentice to browse and examine the fonts installed on your Windows system. 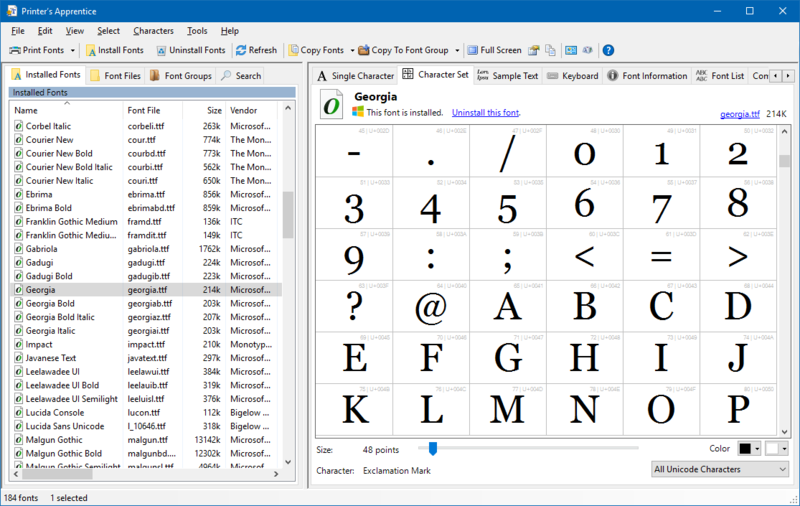 Currently Installed Fonts, Font Files and Font Groups are displayed in lists on the left side of the screen. 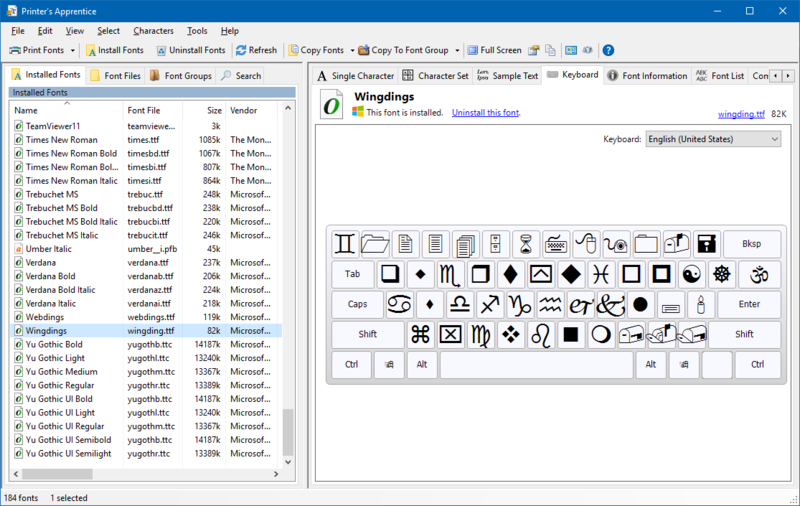 Single character, character set, sample text and and keyboard views are integrated into the main interface using tabs across the top. A standard Windows menu and toolbar provide access to other functions in Printer's Apprentice. OpenType, TrueType and Type 1 fonts are all supported. Use Printer's Apprentice to manage and organize font collections of any size. 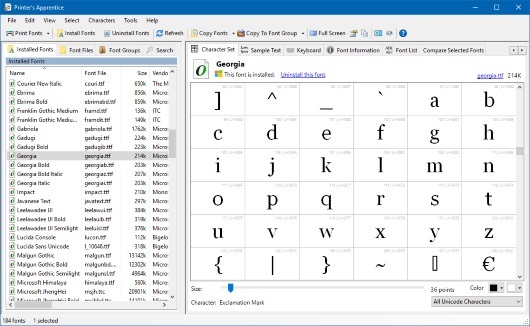 Preview font files from any source without installing them. Features a familiar Windows Explorer-style user interface. 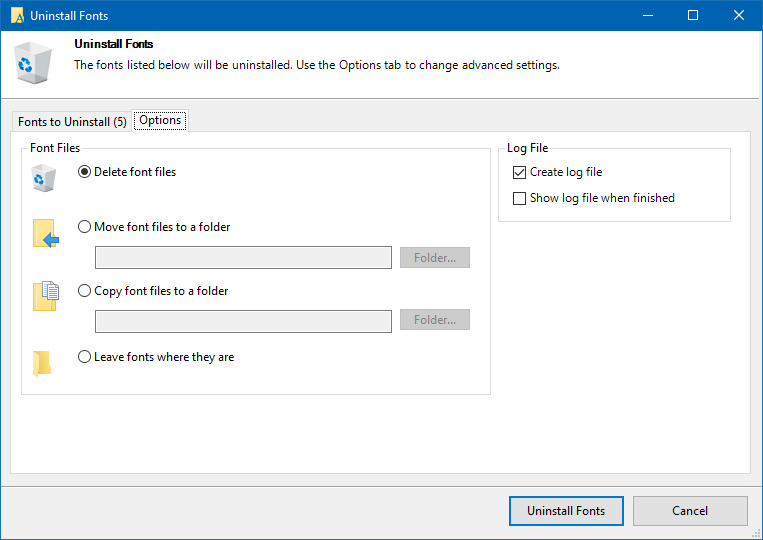 Use the Install and Uninstall features to quickly manage the fonts on your system. No rebooting is needed. 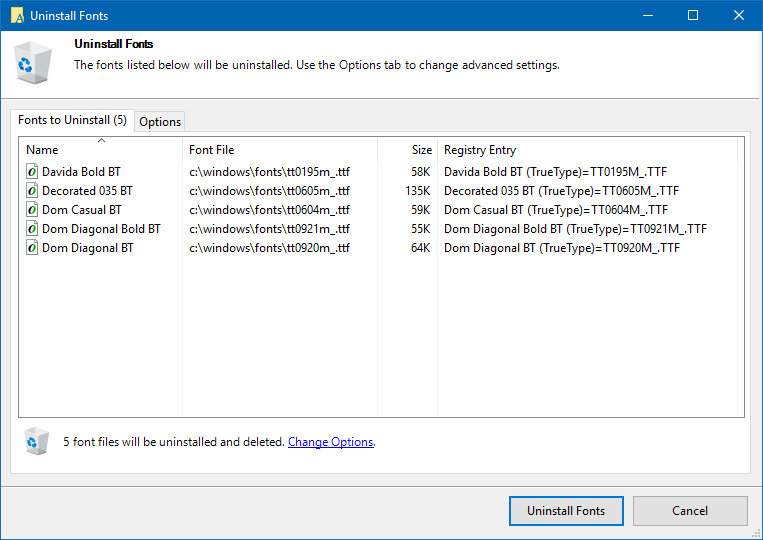 Uninstall functions removes fonts from Windows, deletes font-related Registry entries and can optionally move font files to another location for backup. 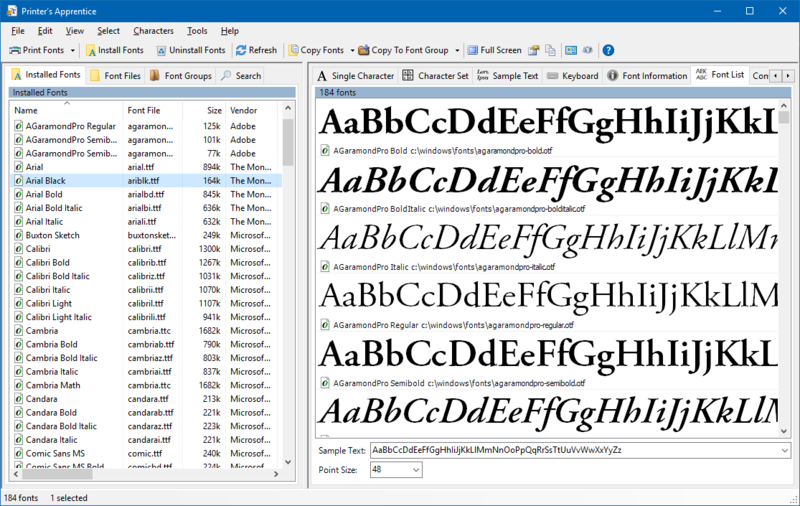 Organize font files into user defined, folder-based font groups. See how great your fonts look on the printed page! Print font catalogs and sample sheets with Printer's Apprentice for reference or for your customers. 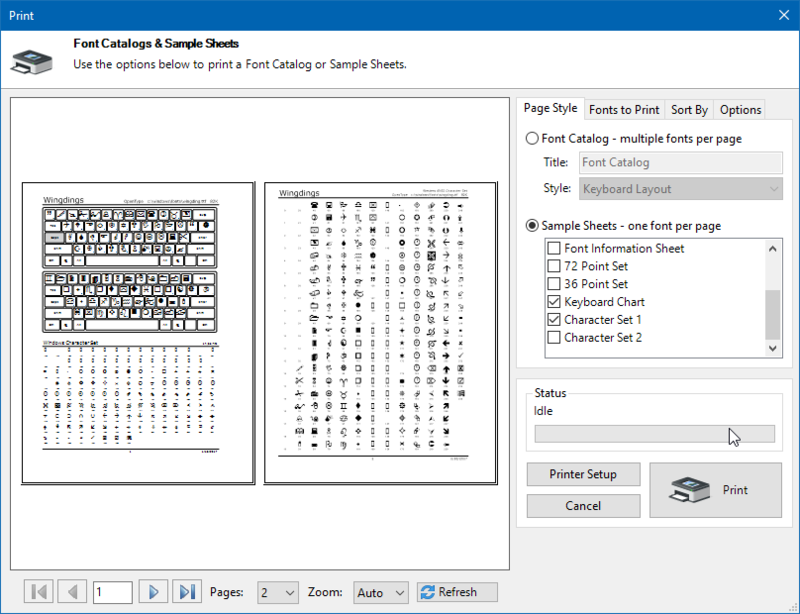 See the Font Catalogs and Sample Sheets page for previews of all the printed output. 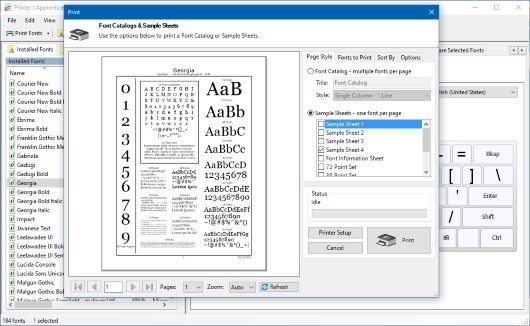 Easily print many sample sheets or catalogs for multiple fonts at once. Printed output works with both installed fonts and uninstalled fonts on any media. You don't have to install fonts to print them! 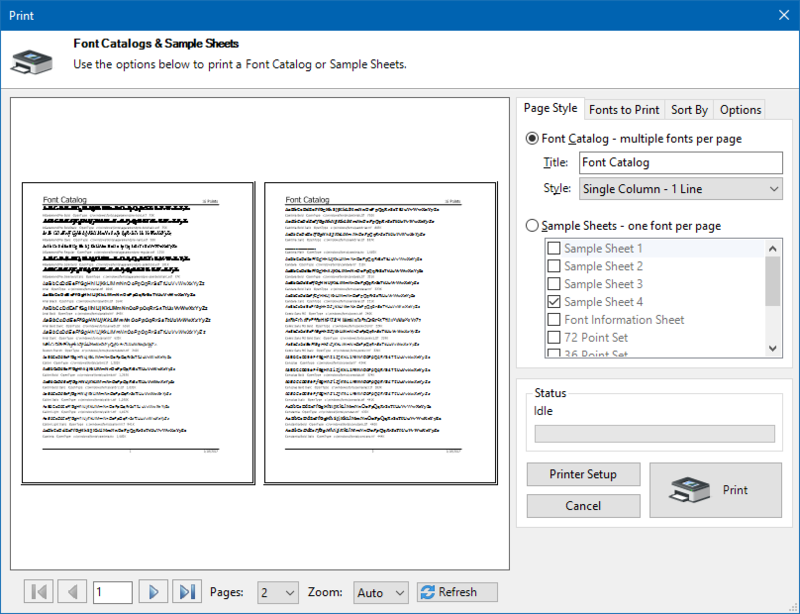 Multi-page, zoomable Print Preview window shows you what the output is going to look like. 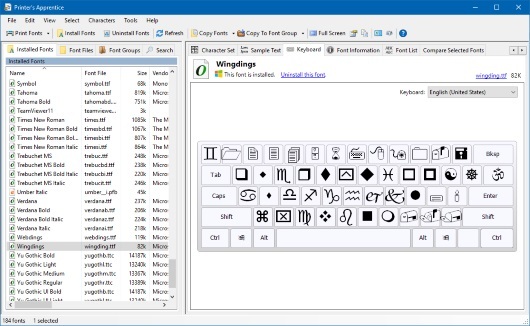 Print Keyboard and Character Set charts to help you find those special characters. 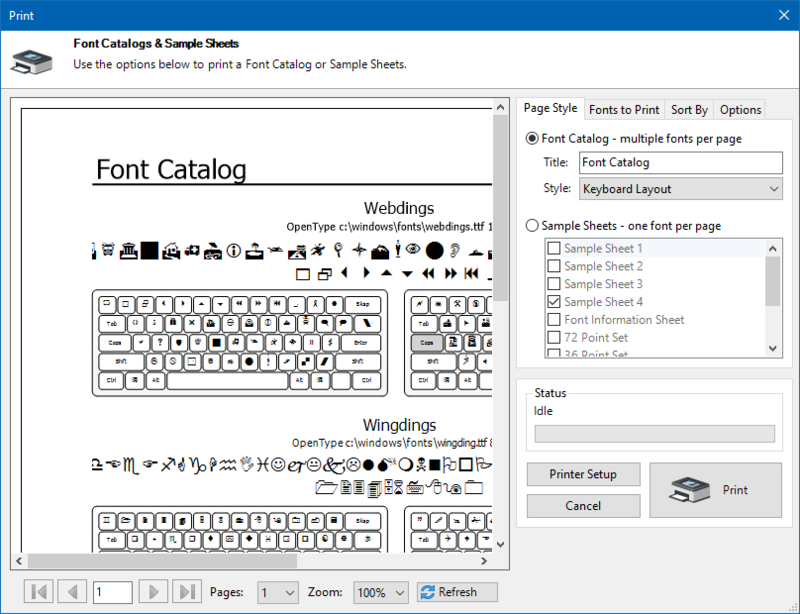 Features 8 different professionally designed catalogs for printing multiple fonts on a page and 9 single font sample sheets. 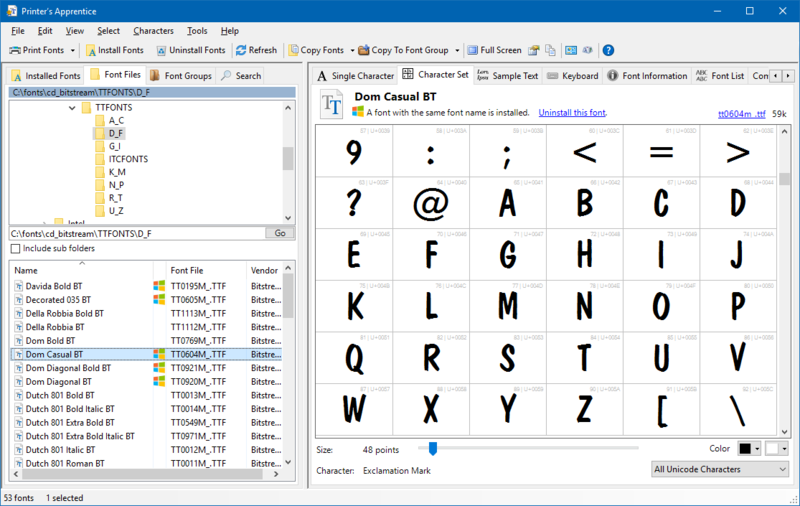 Printer's Apprentice has many other features that make it the Windows font manager you will use every day. We encourage you to download the software and try it out. If you don't like Printer's Apprentice, it is easy to uninstall. Check out the complete feature list to see all the fantastic things you can do with Printer's Apprentice! Download Printer's Apprentice Show me more features! We are always working on updates for Printer's Apprentice. Follow us on Twitter or subscribe to the RSS feed for the latest news. September 19, 2018 - Some anti-virus packages are reporting that the latest Printer's Apprentice Setup package contains a virus. This is not the case and the results are false positives. Our development and hosting machines and are regularly scanned for malicious software. You can review the VirusTotal report for Printer's Apprentice here. here - VirusTotal report for PrintersApprenticeSetup.exe . We are investigating the issue and trying to determine the cause of the false positive results. If you have any questions, please contact us directly using our Technical Support Request page. 09/19/18 Printer's Apprentice 8.2 Released! We are pleased to announce that Printer's Apprentice 8.2 is available. There are a ton of new features in this version and we are working on the web site with new information and screenshots. A comprehensive, detailed list of changes can be found on the Printer's Apprentice Version History page. Download link: Printers Apprentice 8.2. 06/21/17 Web site enhancements underway! We are doing a lot of work behind the scenes to enhance the web site. Contact us if you run into any issues! 01/25/17 Printer's Apprentice 8.1.37 Released! Printer's Apprentice 8.1.37 is available. The list of changes can be found on the Printer's Apprentice 8.1 Version History page. This version updates the certificate used to sign the application executable. Download link: Printers Apprentice 8.1.37.